From Chopin PLaza in Miami, USA you have a great view on Brickell Key Park. 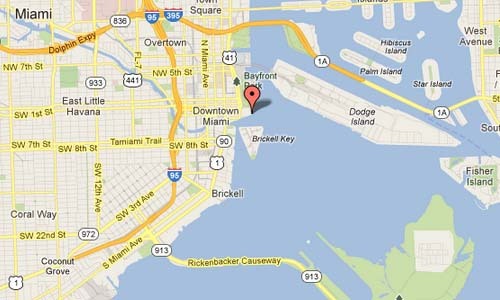 Brickell Key is a man-made island of the mainland Brickell neighborhood of Miami, Florida, United States. Also called Claughton Island, the neighborhood is just east of Downtown Miami and the Miami River. 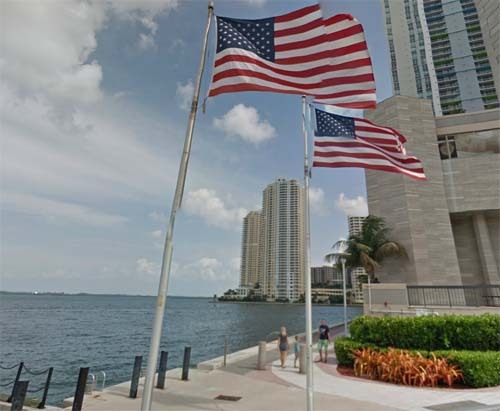 The history of Brickell Key real estate can be traced to 1896, when Henry Flagler had a 9-foot (2.7 m) deep channel dug from the mouth of the Miami River. In the process, Mr. Flagler created an off-shore property composed of two small islands. In 1943, a real estate investor, Edward N. Claughton, Sr. acquired the Brickell Key islands and eventually purchased additional bay bottom land to combine them to a 44-acre (180,000 m2) triangle-shaped tract separated from Brickell and Brickell Avenue by only a few hundred feet of water. In the late 1970s, Swire Properties purchased most of the island real estate property from the Claughton, and began to put into place a master plan that would ultimately transform it into one of the most distinctive island communities in the world. Also developed by Swire Properties, the Asia Condo is the final project to be constructed on the island. It features 123 total units and 33 floors completed in 2008.